Staining of human tonsil. Formalin fixed, paraffin processed tissue. Mag. x 100 with Mouse anti human CD23 (MCA1810T). 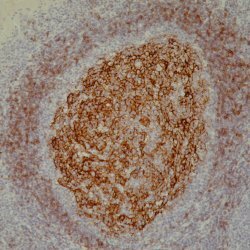 Mouse anti Human CD23 antibody, clone 1B12 recognizes the human CD23 cell surface antigen also known as FcƐRII (Fc epsilon Receptor II). CD23 is a 45 kDa glycoprotein that functions as a low affinity receptor for IgE. CD23 is expressed by peripheral B lymphocytes, cells of B cell chronic lymphocytic leukaemia and upon EBV transformed lymphoblastoid cells. Watson, P. et al. (2000) Monoclonal antibodies recognizing CD5, CD10 and CD23 in formalin-fixed, paraffin-embedded tissue: production and assessment of their value in the diagnosis of small B-cell lymphoma. Steiniger, B. et al. (2011) The follicular dendritic cell network in secondary follicles of human palatine tonsils and spleens. Histochem Cell Biol. 135: 327-36. Yoshida, S. et al. (2005) Primary breast diffuse large B-cell lymphoma shows a non-germinal center B-cell phenotype. Tasaki, K. et al. (2007) CD5-positive mucosa-associated lymphoid tissue (MALT) lymphoma of ocular adnexal origin: usefulness of fluorescence in situ hybridization for distinction between mantle cell lymphoma and MALT lymphoma.